The JASO M343 specification test evaluates the degree of engine output decrease, due to deposits of carbon in the exhaust system etc, from lubricating oil, used in 2-stroke gasoline engines, such as motorcycle engines, utility engines and outboard engines. Perform mode operation until an inlet pressure of 2kPa is reached, whilst controlling the load between 0 and 750W, on the basis of a specified exhaust gas temperature. Test Sequence: In the first stage, two test engines are run simultaneously on fuels containing the standard reference oil and candidate oil. 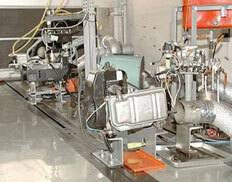 Each engine is then reconditioned and the tests rerun with the fuels used in each engine switched.